over and the other near relatives were there. We had a delightful days visit and the folks had such a good dinner. I came home at 4.15 I spent the evening knitting and reading. I hope we will all be here next year. Sunday January 6th 1907 It was a bright morning and I prepared things for dinner and went to church. It clouded up at noon. In afternoon and evening I read some and wrote to Anna Hartsock and Mollie Fletcher. Monday January 7th 1907 It was still cloudy. I was busy sewing most of the day as the house work was not much to do. Will was in town till late dinner time as the board of trustees met to transact the final business of the year. I was busy knitting in evening. 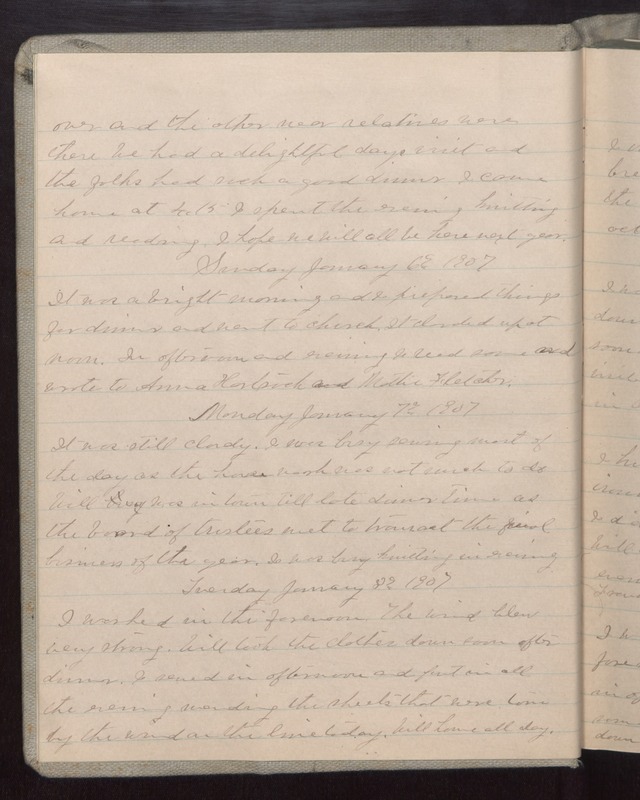 Tuesday January 8th 1907 I washed in the forenoon. The wind blew very strong. Will took the clothes down soon after dinner. I sewed in afternoon and put in all the evening mending the sheets that were torn by the wind on the line today. Will home all day.